At his point of the season, we know which teams have been consistently tearing it up all year long. Some relays have been on point since week one and some have been picking up steam as the season progressed. However, some teams have just started to hit their stride late in the season. As coaches have gone through their line ups and found the right pieces, we are now getting a clearer picture of exactly who the big dawgs are in the relay events. Here are a few relay teams you might want to watch out for as the final weeks of the season are coming up. Shadow Creek is the new Alvin ISD school in the Houston area. It is only in it's third year of existence and it has already made a name for itself. The school made it to the state finals in football in the fall and now they have the momentum going this track season. Their boys 4x100 relay is the real deal! They ran the second fastest time in the nation at the 40.36 at the UIL 5A - District 24 behind US #1 Fort Bend Marshall. They are led by All-State sprinter Ashton O'Conner, but are clearly more than a one man band. 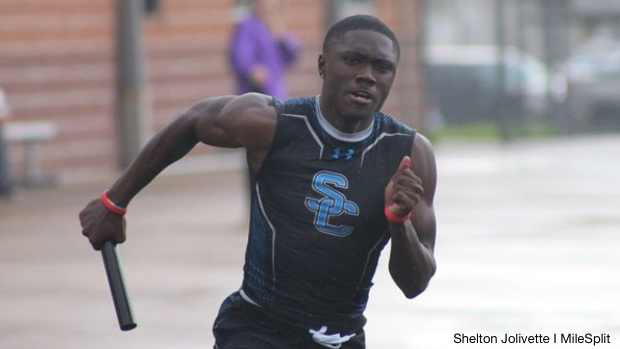 They haven't gotten the attention they deserve due district competitor Fort Bend Marshall's continued success, but Shadow Creek is just getting started. I know, I know, I know you may be asking, how is Lancaster going to be on a list of surprises and teams to look out for? However, they have been consistently good, but they weren't hitting their stride, just yet. If Texas Relays was any indication, it is clear Coach Humphrey's squad is getting primed and ready to go. They ran a TX #3 1:38.27 in Austin to win the 4x200 relay and they know that running fast early in the season is good and dandy, but the time that counts is now. Keep an eye on the Lancaster girls! Klein Forest won their district meet in the 4x100 and the 4x200. That is really all that matters at this time of year because that ensures another week and practice time to improve. What lands them on this list is that they ran elite level SBs. The 4x100 relay dropped a 40.80 at the UIL 6A - District 15 to add to the list of sub 41s this season. They also dropped a US #2 1:24.57 in the 4x200 relay at the district meet. Summer Creek is another team getting hot at the right time. They have shown all season long that they are good, but their times are starting to show that they can compete with anyone. They have been fairly consistent all season long and lowering their 4x100 relay SB to 46.43 at the UIL 6A - District 22 meet is big. The area meet will be a test to see if they can continue to lower their time and advance. Like the other teams on this list, the Longhorns are peaking at the right time. George Ranch always seems to find themselves right in the thick of things and this year is proving to be no different. Their sprint relays ran very well at the Texas Relays and they have maintained an upward progression through their UIL 6A - District meet. Dropping a 40.97 SB in the 4x100 relay at district, put them in the illustrious sub 41.0 club and then their 1:25.52 in the 4x200 relay has them ranked #5 both in Texas and nationally. Kennedale is a 4A school, but they still forced themselves on the list. Their 46.37 in the 4x100 relay at the UIL 4A - District 9 not only has them #1 in 4A, but ranks them #4 in the state. They have All-State sprinter Alexis Brown that drastically helps them out, but they also have two stud sophomores in Skylar Lewis and Brianna Brand who are also doing some heavy lifting for the squad. Lancaster's 4x100 relay started off hot at their own Meet of Champions as did their 4x200 relay, but the season has been more than that meet. 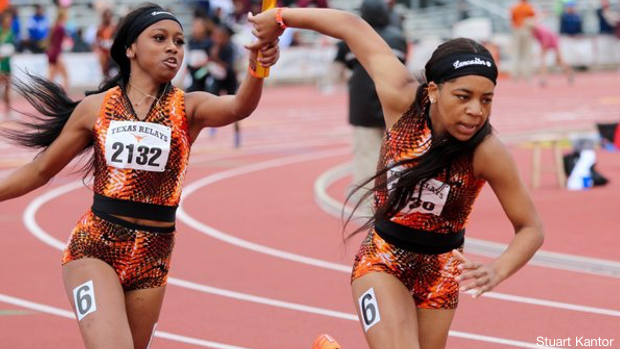 At the Texas Relays finals, their 4x200 relay was in command until a hiccup in the exchange. They dropped the stick, but it was clear that the South Dallas boys have the speed. They had a safe race at the UIL 5A - District 13 meet with a 1:25.45, which was all they needed to do to advance. Lancaster's 4x400 relay is also catching fire. They dropped a SB and 5A #2 3:15.89 at district and they are looking impressive during the early road to the state meet. If you pay attention to things, you know that Converse Judson is predictable. Even though most of their season times don't catch eyeballs throughout the season, they always start clicking around Texas Relays and even throughout the qualifying rounds. Then they get to Austin for state and explode like a bomb. They are taking those exact same steps now. Texas Relays was a success for them and maybe just the tip of the iceberg for the remainder of the season. 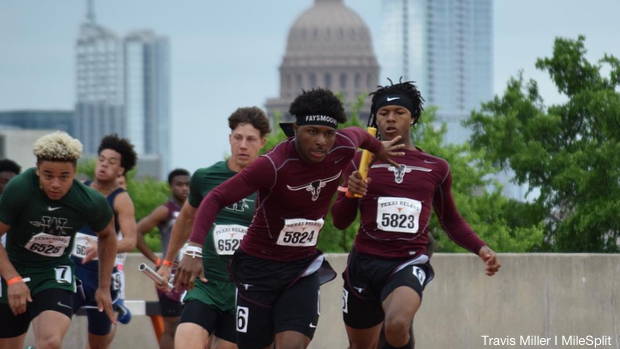 Their UIL 6A - District 26 wasn't earth shattering in the 4x100 relay as they ran a SB of 41.46, but we've seen them run 41s before and make 40.x look easy at state. They did drop a superb 1:25.77 in the 4x200 relay for a TX #8 and then a 3:16.89 for the 10th best time in the state. Don't overlook the Judson boys!